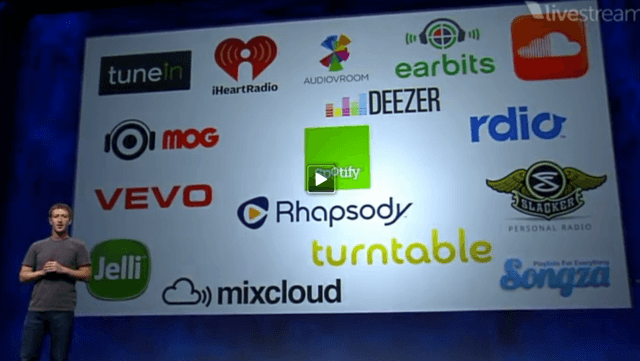 Facebook’s 800 million users will be able to play and share music from Spotify, MOG, Rdio, Rhapsody, Turntable.fm, VEVO, Slacker, Songza, TuneIn, iheartradio, Deezer, Earbits, Jelli, mixcloud and other services, right from their profiles and News Feeds. Facebook will enable the discovery, sharing, buying and renting of movies and TV shows via Netflix, Hulu, Blockbuster, IMDB, Dailymotion and Flixter. And just as the iPad is gaining traction as the electronic newspaper of choice, Facebook announces partnerships with the Wall Street Journal, the Washington Post, Slate, the Associated Press, Reuters, Yahoo News and others to make Facebook the default online newspaper site. Apple isn’t so much a consumer electronics company as it is a media platform. Apple’s success in the last 10 years has all been about changing how people create and consume media and content. In the past decade, Apple has succeeded beyond anyone’s imagination with iPod, iTunes, iPhone, the App Store, the Apple Store and the iPad. And although Apple TV hasn’t succeeded on the same level as other runaway hits, it’s still pretty cool. The theme with all these success stories is that they’re all part of a unified strategy for Apple to fix what’s broken with the experience of consuming media and content. This unified strategy represents a model or a paradigm for how we enjoy electronically deliverable culture: We discover, buy and enjoy music, movies, TV shows, books, audio books, magazines, newspapers on iTunes, then play or view them on any Apple gadget we like. Halfway through a movie on the iPad, and I can zap it over to the TV for the second half. It’s elegant, integrated and fun. Now Facebook has moved aggressively into Apple territory with a competing model or paradigm for all this. The Facebook model is that we discover content not by browsing iTunes, but by monitoring our New Feed for what our friends and family are enjoying. When we see a friend is listening to a song, we’ll be able to tune and listen with them. We’ll allow our friends to influence purchases and rentals for TV, movies and all kinds of content. The Facebook initiative has critics, including Yours Truly. But Facebook can’t be dismissed as a threat to Apple. The new Facebook leverages that social network’s massive reach (which CEO Mark Zuckerberg claims attracts a half-billion users a day) to attract attention to iTunes alternatives. Either Facebook will succeed as a “primary entertainment hub,” or it will fail. If it fails, then Apple has nothing to worry about. But if Facebook succeeds, it threatens Apple’s entire business, and the future of Apple’s stellar growth. More to the point, if Facebook succeeds, the social media paradigm succeeds. And if social discovery of media is the future, then Apple needs to be there. Don’t even get me started about the “P” word. The trouble with iTunes Ping is that it’s a social network about music. That’s not a paradigm with a future. The Facebook paradigm is a social Internet alternative where not some but all your online social activity takes place, and where media is also shared. People want to gather in the big public square, not huddle in some musty and disreputable record store. Apple’s “core competency” — the one thing Apple does best — is the replacement of clunky, confusing and ugly methods for consuming content with a clean, simple and beautiful Apple alternative. This is what Apple did with the iPod, iPhone, Apple TV and the iPad. And “clunky, confusing and ugly” is exactly what Facebook has become. Now that Facebook is a media platform, it makes sense that Apple would want to provide the elegant alternative. Right now, the only real contender for the social crown is Google, with it’s vastly superior Google+ network. And Google+ provides a great model for an Apple social network. For starters, Google+ showed that you can use email to include your actual social network in the addressing of your posts, even if your family and friends never heard of the social network you’re on. That would be a great feature for Apple’s social network. Google compiled its social network in large measure from existing services. Google combined Profiles, Gmail, Picassa, Talk, Voice, Contacts and other existing offerings — plus they stripped Google Buzz for parts — and used these components as the functioning building blocks for Google+. They also did some really top-shelf interface design, especially the Google+ circles editor, a projected headed by one of the lead designers of the original Macintosh. Apple could do the same thing. They could integrate Ping, MobileMe/iCloud, Contacts, iTunes and — wait for it — a Hangouts competitor based on FaceTime into a freshly designed, elegant do-it-all social network. In fact, Apple already has the most difficult and expensive parts of a killer social network. And, come to think of it, Google is another would-be usurper of the Apple crown, first with the Android platform and then with the Motorola acquisition. Facebook and Google are fighting for the future of mobility, media sharing and in fact the future of the social Internet. They’re also the two biggest companies with the nads to boldly challenge Apple over its core businesses. It makes perfect sense for Apple to hit back and challenge these two companies in the world of social networking. Apple has fewer “users” than Facebook and Google. But nobody’s fans are more loyal than Apple’s. Apple’s iCloud service functions as online storage for pictures, music, movies, books and other content, as well as an email platform. In fact, this is a major component of any Facebook killer. The vast majority of Facebook’s costs center on bandwidth and storage for photos, for example. Both Facebook and Google will figure out how to get your credit card number one day. Everybody wants to be Amazon.com, where users click one button to spend money. Facebook and Google intend to use integrated social networking features to motivate you to register all your credit card info on those social networking sites for one-click purchasing. Meanwhile, Apple already has your credit card. The integration of music, movie and TV purchases on a social network could happen on a wide scale via the Apple network even before it really happens on Facebook or Google. It would also integrate and leverage location data, and thereby integrate online with real-life social activity. In fact, there’s some evidence that Apple is planning something along these lines. A few weeks ago, someone discovered code buried in the iCloud website that refers to a feature called “Find My Friends,” which suggests at least a Google Latitude like feature launched from iOS Contacts and at most a mobile social network. Facebook this week has boldly slapped Apple in the face, challenging them over the future of media consumption. And I think Apple should hit them back, by doing what they do so well: Replacing the ugly, the confusing and the clunky with a superior alternative that’s elegant, beautiful, simple and clean. If Apple launched social network, would you join?